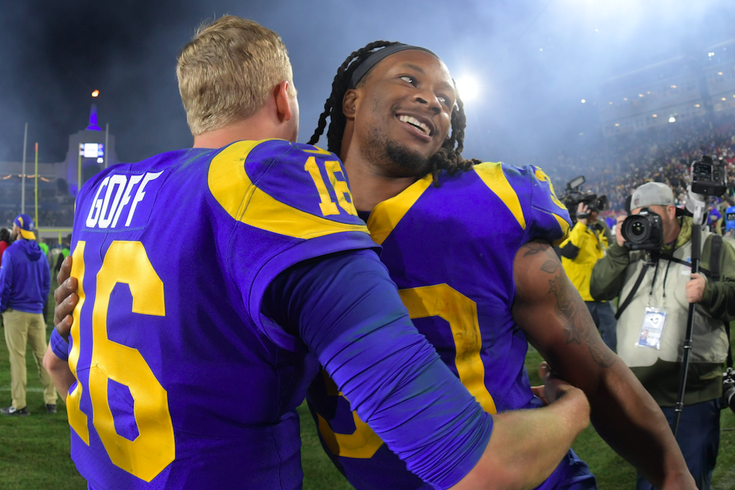 Los Angeles Rams quarterback Jared Goff (16) and running back Todd Gurley (30) embrace after defeating the Dallas Cowboys in a NFC Divisional playoff football game at Los Angeles Memorial Stadium on Jan 12, 2019. The Los Angeles Rams will have a chance to hand the New England Patriots their second consecutive Super Bowl loss this Sunday in Atlanta. Head coach Sean McVay will need to be creative to keep up with a reliably strong Patriots offense. Even if the Rams find themselves holding a lead, as the Eagles did well into the second half of Super Bowl LII, they'll likely need to make some gutsy play calls to get there and stay there. Could they opt for something like, say, the Philly Special? During "Media Week" for Super Bowl LIII, Rams running back Todd Gurley was asked whether L.A. would consider reprising the Eagles' famous Fourth-and-goal trick play. Way to throw your quarterback under the bus, Gurley. On the other hand, Tom Brady can't catch, either — and he's supposed to be the GOAT. Goff, who's never caught an NFL pass, had two receptions during his three seasons at Cal. One of those catches was for 11 yards and the other was for -1. That doesn't mean the Rams can't find ways to spice up their playbook in critical situations, or when the Patriots would least suspect it. Remember that the Patriots called their fake — the one Brady dropped — before Nick Foles suggested running the Philly Special. Eagles fans have plenty to watch for in Sunday's game. The inevitable comparison of Goff and Carson Wentz at this stage in their careers will be a narrative that takes on added fire going into next season. It's doubtful we'll see the Philly Special reappear in Sunday's game, but there's probably a good prop bet out there on whether the Rams will show the world a Hollywood Special.